Add herbs, a hint of cayenne or sesame seeds to this recipe, it’s all good! The wonder of this simple dough is that it turns into a light and crispy consistency, resembling puff pastry, without the hard work. You can add herbs or spices like cayenne pepper to the dough or some sesame seeds to the cookies before they go into the oven. I like them best plain I think. You can also add a hint of salt if your cheddar is mild. This recipe is too easy! But the result is fabulously ‘cheesy’. Just take equal parts of flour, butter (in little cubes) and good quality cheddar cheese, very finely grated. 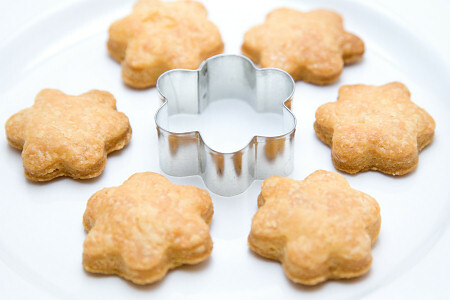 With 100 grams of each you will get about 40 small cookies of 4 x 4 cm. Rub the butter with the flour, add the cheese and stir. Add one egg yolk and quickly form a dough. If it feels too sticky just add a little extra flour. Rap in cling film, shape into a flat disc for easy rolling later on and put in the fridge for 30 minutes. Preheat the oven at 180ºC / 355ºF to 200ºC / 390ºF conventional setting, depending on your oven. Roll out to about 3 mm / 0.12 inch thick between two sheets of cling film and make nice shapes with a cookie cutter. (little fish with your fish soup, stars for Christmas, little animals for the children, leafs for fall etc..). Arrange the cookies on a baking sheet and bake for 15-20 minutes, depending on your oven, temper it when you think the browning is right. When they look golden brown and crisp, take them out and leave to cool on a rack. These sound awesome. Going to make these for Christmas. Happy Christmas baking Wende, hope they turn out great! Seasons greetings! I’m planning on making your cheesy cookies today and I think there’s a typo in the recipe. Rolling them to 3 mm would be closer to .25 inch I believe. 1.2 inches would be 30.5 mm. Or are they meant to be a thick cookie? I’m going to try them with a dollop of jalapeno jam (slightly sweet with a nice heat to it) that a friend made. On behalf of your friends in the U.S., can you confirm if this is correct or not? Thank you! Thank you so much for pointing out this error. Yes you are right it has to be 0.12 inch (or 0.118 to be exact). I already corrected it in the recipe. Your jalapeno jam sounds like a great combo with the cookies. Happy baking and enjoy the holiday season! I have tried your recipe and it worked out really great. Though my cookies a little bit salty (I did not at any salt at all), I think it was due to the kind of cheddar cheese we have here in Indonesia. Thank you for the recipe, great website you have here! We told you Pete..they are too good..you keep eating them. First time I made them I was so surprised that such an easy recipe turns out like delicate puff pastry. They are a family favourite with us too. And so easy to make. I’ve made these cookies at last. They are delicious. My mom & my daughters all love it. Thanks for the recipe. Indeed, there is no sugar in these cookies! PS: Angie, from ‘my kitchen my laboratory‘, has made a wonderful herby version with my basic recipe. I was thinking of making this but need to confirm with you. There is no sugar in this cookie recipe? Many thanks! My mom (we are Dutch living in the U.S.) makes these cheese balls. Delicious! I linked my blog to yours and showcased your Speculaas recipe. Hope you don’t mind! oooh, those are so simple i love it! look delish too, buttery and savory – i think i have to make them to serve with soup one of these chilly nights. thx for th recipe, yay!